This adorable set of three cheeky gnomes is full of color and personality. These three figurines, Seth, Henry, and Steven, are otherwise known as the "three wise gnomes." They are recognized famously around their gnome village for their gestures that represent the common proverb "hear no evil, speak no evil, see no evil." Their mischievous expressions and playful demeanor imply they're up to no good, but the truth is they're mostly excited to greet and welcome your house guests! With their spunky personalities and cheerful faces, you're sure to add charm and laughter to your indoor or outdoor space! OUTSIDE YARD GNOMES DIMENSIONS: Henry Hears No Evil: 3.5 inch wide x 5 inch deep x 12 inch tall. Seth Speaks No Evil: 3 inch wide x 4 inch deep x 12 inch tall. Steven Sees No Evil: 3.5 inch wide x 4.5 inch deep x 12 inch tall. Each gnome weighs about 1.5 pounds. DURABLE DESIGN: These funny figurines are made from a sturdy polyresin material that is lightweight and easy to maneuver. All gnomes should be brought indoors before freezing weather occurs. 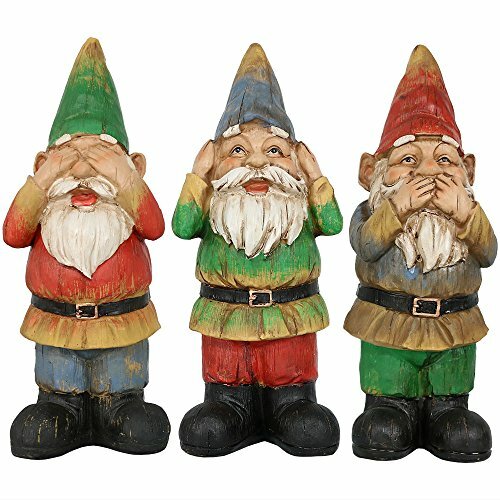 CLASSIC STATUE COLLECTION: This fun set of three gnomes represents the famous proverb: "hear no evil, speak no evil, see no evil". DECORATIVE COLOR SCHEME: The vibrant and detailed colors of these unique garden gnome are sure to compliment your landscape (Note: Colors may vary slightly from on-screen images).